I feel truly delighted and honoured and privileged to welcome you here to this 16th conference of NELTA. Your gracious presence in this august gathering has added to our belief that networking works in teacher professional development. At this moment, I would like to begin with my sincere appreciation to those who initiated NELTA and also those who nurtured it. NELTA that now operates through its over 30 branches spread all over the country, has over 1700 life members and several hundred general members and a sizable number of institutional members. NELTA that encompasses teachers, learners and enthusiasts of English of every kind, from schools to universities, public and private, from every walk of like. NELTA that is looked up to by ELT colleagues and other professionals of home and abroad. NELTA that does not market for membership but its size grows every year. NELTA where we learn and let learn. This is not just eulogizing. This phenomenon has a theory behind it. This is not just a theory now. It is a reality. How is this possible? This is possible because NELTA’s foundation is built on three ships S-H-I-P-S: membership, partnership and relationship. First the membership: Our strength is our members who bring with them ideas and aspirations, hopes and dedications, they give and they take as I said earlier. They put pressure on the leadership and bear the pressure of the tasks assigned to them. They are the backbone. Second this partnership, without partners we would not be where we are today. Together with the partners, we run the conferences, training programmes, English language courses, radio programmes, surveys and other research studies, disseminate the ideas, make interventions into where English is important. Together with the partners, we think and act. Third is the relationship. We build relationship with the individuals and organizations home and abroad. We share our experiences, best practices, learn and let learn. We network with other networks. Now I would like to highlight some of the recent achievements which are also listed in the programme that you in you in hand. We have made progress in the ELT survey in which NELTA works with the National Planning Commission, Ministry of Education, British Council and the US Embassy. Our survey design including the tools is almost ready to be implemented. Now time to put together funds. NELTA and the US Embassy have just started a two year Access Micro-scholarship program in which we teach English to the non-elite youths in Kathmandu , Gorkha and Bhairahawa. NELTA has collaborated with Radio Sagarmatha in the English by Radio program supported by the US Embassy and it is very popular. Also, the US embassy has been very kind to supply the ELT Forum magazine to all the life members of all the NELTA branches. Another support from the US is that we now have Senior English Language Fellow Dr. Barbara Law, who is travelling with NELTA trainers to different branches and reaching the unreached. 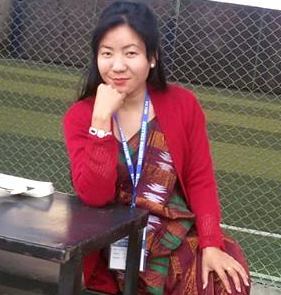 NELTA now manages the six ETAs in Lalitpur under the Fulbright Commission ETA program and we have planned to have six ETAs to work with NELTA next year. We partnered with British Council to implement the English for Teaching and Teaching for English (ETTE) project at the branch level. A cadre of NELTA trainers have received training from the British Council. They will cascade it in different parts of the country. The NELTA participants of the British Council’s Learning Centre training now receive joint certificates signed by the NELTA and the British Council. The British Council and NELTA are now working out how we can collaborate in teacher and learner support activities such as the Global products. Capacity building of the NELTA leaders and members is our priority. With the support from the British Council and the US embassy, NELTA members have participated in different international courses and events, TESOL USA and IATEFL, UK. With their kind support eight NELTA speakers represented the ELT of Nepal in the first teacher educators’ conference in Hyderabad India recently. We are very pleased to share with you that the selection for the Hornby Scholarship to do a Master course in the UK is underway. This has been possible with the fresh initiatives taken by the British Council Nepal and the Uzbekistan office. The announcements will be made soon for the Bell Centre the UK’s scholarship to attend trainer’s development course in the UK. This is special arrangement between NELTA, Bell Centre and the British Council. Altogether six trainers completed a trainers’ course from EFLU India in the last three years, RELO India and the US Embassy collaborated with the EFLU on this. The TEFL International provides scholarships for the NELTA recommended individuals to do Certificate and diploma courses. The NELTA journal is peer reviewed and has the ISSN number. The credit for this goes to the highly dedicated editorial team led by Prof. Awasthi. NELTAchautari is a different versions of NELTA forum; Prem Phyak, Ghanshyam Sharma, Bal Krishna Sharma, Sajan Karna, Kamal Poudel and Hem Raj Kafle work to make it resourceful and user-friendly coordinating from places of varying clock times. The yahoogroup has been an excellent forum for our members to connect themselves with the global ELT. Please log on to these sites, learn and let learn. We cannot sit back and rest because achievements have been made, there lie newer avenues with newer challenges. On the one hand, NELTA has to continue the projects already initiated, on the other it has to look for un-trodden paths for newer achievements. This calls for the collaboration and coordination with stakeholders in more effective ways. While we need a strong and leading Centre, without stronger branches we will not step ahead. The implementation of the ELT survey project still remains a plan and will need to be realized into concrete actions. Whatever the plans and ambitions, without the active participation and cooperation from all the sectors including the government, nothing will happen. I hope we will stand united in every effort NELTA makes. This conference is richer than before with more than 150 speakers from more than 17 countries. I would like to welcome the two key speakers Prof. Adrian Holliday and Prof. John Fanselow, plenary Brian Tomlinson, Sheilagh Nelson speakers and the presenters including the representatives of our neighbouring ELT organisations like SPELT, BELTA, SLELTA, ELTAI and all the participants from home and abroad. I would like welcome you all to this Himalayan nation and to express my gratitude to you all for accepting our invitation. I wish all the participants and speakers to have a memorable time. I also wish the foreign and out of valley participants a pleasant stay in Kathmandu. Please bear with us for any discomforts you may suffer. Finally, I take this opportunity to thank DAV Sushil Kedia Vishwa Bharati Higher Secondary School who have made such a contribution by providing the venue and facilities including human resource that we remain thankful to them. Thank you DAV team. My sincere thanks go to our sponsors, supporters and exhibitors the British Council, the US Embassy, the Cambridge University Press, the Oxford University press, the Routledge India, the Ekta Books, the Brikuti Books. I can speak here today because for the last few months, NELTA colleagues worked tirelessly day and night. I would like to document their voluntary and sincere contributions to make this event a grand success. I am very excited to read the presidential speech by former president of NELTA. The speech has impressed me a lot. It is a good piece of writing. I missed the 16th international conference of NELTA. However March issue of NeltaChoutari has given me a lot of information about the conference. I promise I won’t miss the opportunity the next year.